Dinerwood: Los Angeles Diner Reviews: Stevie Dee's Cafe - Shake the Shack. Chuck's Diner, the name change is, I'm sure, how it came up as a result for "new" restaurants. 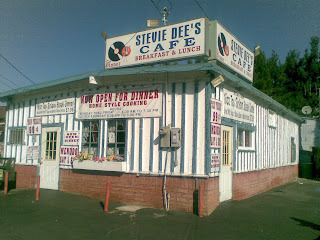 Stevie Dee's Cafe is a shack by the railroad tracks. 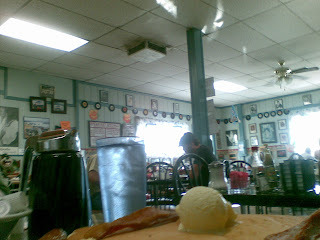 It's a "50's Diner," which usually means enough kitsch to make you throw up your chotskies. As soon as you walk inside, ou know the place is going to be an experience; there are innumerable pictures of Elvis and Marilyn everywhere. Elvis as a cowboy, Elvis as a soldier, Elvis as your barber, Elvis as your mom. And Marilyn as...well, Marilyn. Like in most--scratch that--ALL 50's diners, there is a collection of Coca-Cola merchandise for sale. Why is this a trope of this style of diner? If anything, Pepsi is more of a icon from the 50s. 50's diners are all about an odd nostalgia for the pop culture of the time. Coke's never left the consciousness of the culture so it can't be dated to a specific time. Never has the Pepsi brand been so heavily pushed as it was in the 1950s. 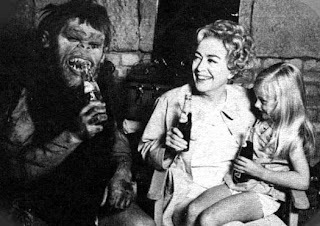 PepsiCo had Joan Crawford and a giant monkey-man hawking it, for Pete's sake! Why does Coca-Cola have such a lock down on nostalgia? I'll be the first to say; I like that 50's kitsch. I went through my rockabilly phase and have the pomade to prove it. Growing up, my older sister went through a phase where we actually redecorated her bedroom to look like a 1950's malt shop--black and white tile and all. I have my James Dean, Elvis, Marilyn, Brando in "The Wild One", 'Chantilly Lace,' and 'Pink Carnation and a Pickup Truck' pedigree. I can also see how that kind of environment might provide an annoying dining experience. What saves Stevie Dee's Cafe is that this building looks and feels really...old. It's a folksy charm place, with a 'well-gosh-darn-it, we're going to make due with what we got attitude.' It's old without being decrepit. Its out of the way location (not being by an off ramp or a shopping center) makes me imagine it as a "locals only" establishment where a fella could just disappear into a new identity, forget all the wrong he's done, and start living right with God. We sat down at our table and pulled our the menus from the little holder on the table. Glancing through them, we were surprised at how cheap everything was. The most expensive item on the menu was the T-bone and eggs, as $8.99. The cheapest, coffee at 99 cents. 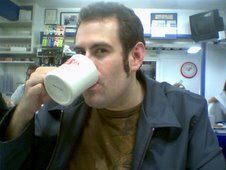 You don't get 99 cent coffee anywhere and it was better than I've had at most run of the mill joints. Although our waitress recommended the french toast, I settled on an old fashioned pancake breakfast ($5.99) while Number One Diner Companion Antoinette went with the Breakfast Special ($3.99). This is a spread of food, all for 4 bucks. The eggs, like mine, were dangerously close to 'too wet.' Antoinette thought they were good, and she's the discerning one. 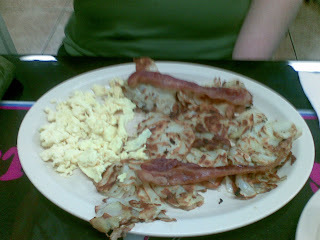 The home fries were thin cut slices of potato browned with just a hint of green pepper, and just greasy enough to be good. 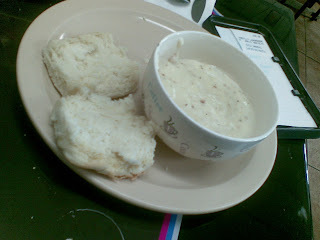 While the biscuit itself was unspectacular, the gravy was excellent: peppery and not too heavy, with large chunks of real sausage soaking in it. 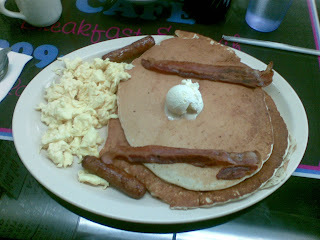 I wish the sausage they used in the gravy was what they served with the breakfast specials. The whole ensemble was exactly what you'd expect. The pancakes were regular ol' restaurant pancakes. The eggs were eggs. The bacon was crispy like it should be. The breakfast links were fine, but I've finally come to terms with the sad reality; I have lost my taste for breakfast links. What are terrible state to be in for a diner reviewer! Alas, here I am. The servers were all over us. I'd take two sips of my coffee and a guy would be there to refill it. Our waitress must have asked us a dozen times if we needed anything else and/or how we were doing. On our way out, we noticed a hand written sign by the door apologizing if the food took too long and for any other inconvenience, and that they phone orders were welcome, to speed up the lunchtime rush. Afterward, as I was looking at the Yelp review for Stevie Dee's, I noted that some had commented about the service being lack-luster. They were clearly trying to turn things around; our food arrived quickly, and the service was nothing less than solicitious. You'll want to note that the parking lot is pretty small, and if the lot ever gets full, I have no idea where you could park nearby. Luckily, this is a hidden away place and I can't imagine it ever gets over-crowded. On weekends they are only open until 3pm but during the week they stay open until 7:30pm for dinner. Stevie Dee's Cafe was a nice find and I wholeheartedly recommend it. Pie: No. They do have home-made cookies, cake, and serve frozen ice cream treatslike the ones the ice cream man sells. The food was good the waitress was great we love her but the big fat guy not so much. He wipes the silverware off with his hand. that very unsanitary. They added to many tables we cant hardly walk, i think they need to know that is a fire hazard . Rather cool blog you've got here. Thanx for it. I like such topics and anything that is connected to them. I definitely want to read more soon. Rather cool site you've got here. Thanks the author for it. I like such themes and anything connected to them. I definitely want to read a bit more soon. This place has stole my heart...I love it and the home feeling. Its a hoot to walk in and see the same people!! I feel guilty with the prices! I rented the whole place out to fam/friends to say goodbye to my son going off to Iraq and they only charged a $1.00 a taco!??? Serious!?? all they asked for in return was a picture of our group to HANG ON THE WALL!! 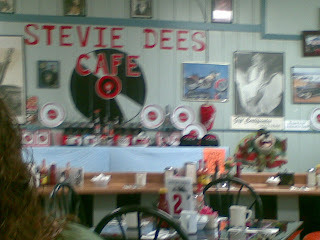 God Bless them all over at Stevie Dees they are one big family! The carne asada burrito has to be one of the best. I ordered it blindly expecting a $4.99 burrito to be mostly beans and rice with a scattering of meat. What I got was what appeared to be 2 lbs of carne asada, no beans, no rice, a perfect amount of cheese and pico de gallo! It seems impossible that they could make money on this item but I'm back every week now to get it.